More than 52 million people in the United States, 21 percent of the population, participate in major means-tested government assistance programs each month, according to the U.S. Census Bureau. 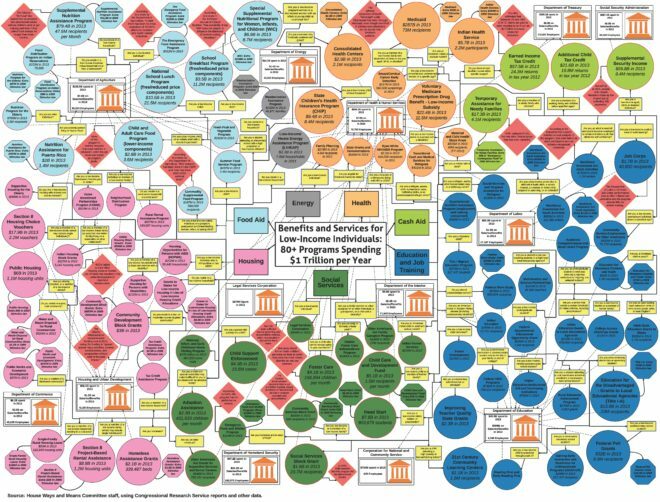 More than 80 federal programs dole out roughly $1 trillion of benefits and services to low-income people annually (see the amazing image above from the U.S. House Ways and Means Committee). The creation and growth of this massive web of government programs are the result of Washington’s “Iron Triangle”: Politicians who want votes and campaign contributions; bureaucrats who want to administer these programs with bigger annual budgets; and program beneficiaries and well-intentioned advocates for the poor. Supporters view these programs as evidence of a compassionate society, helping to uplift the poor and disadvantaged. I would be inclined to agree if not for the overwhelming evidence that these programs, in fact, create dependency, do little to alleviate poverty, and shred the moral connective tissue of a civil society. On the giving side, government assistance relieves individuals of their moral responsibility to personally engage those less fortunate and to provide true compassion and effective assistance to the disadvantaged. Quoting Doug Bandow: “[A]t its most basic level, real charity doesn’t mean giving away someone else’s money. As Marvin Olasky has pointed out, compassion once meant to ‘suffer with.’ Over time it came to mean writing a check. Now it seems to be equated with making someone else write a check.” Jesus said people should follow the example of the Good Samaritan, who did not make someone else pay money to a government program. On the receiving side, government assistance allows aid recipients to disconnect from civil society by having a claim on the fruits of other people’s labor through government taxes and redistribution. People are lured with benefits and services into a giant web of programs, ensnaring them and their family in government dependency year after year, generation after generation. Assistance programs often create a very high implicit marginal tax rate for low-income people if they transition from assistance to work, making assistance the best option for them. And bureaucrats have a personal incentive to entangle as many people for as long as possible in order to grow their budgets and power. In 1935, President Franklin Roosevelt foreshadowed the dependency problem: “Continued dependence upon relief induces a spiritual and moral disintegration fundamentally destructive to the national fiber. To dole out relief in this way is to administer a narcotic, a subtle destroyer of the human spirit.” It is immoral to treat humans like pets by providing for their every need from cradle to grave because this relieves people of personal responsibility for their own lives, destroying self-respect, initiative, and creativity. As noted by economic historian Thomas Sowell, non-judgmental rewards and non-judgmental leniency toward counterproductive behavior are not solutions to poverty, they are breeding grounds for poverty. The U.S. welfare system has cost $15 trillion since the “War on Poverty” began in 1964, yet the official poverty rate has declined by less than 4 percentage points. Relieving people from the responsibilities and challenges of life, especially building skills and performing productive work, does them no favor. Government assistance has expanded to the point that it does more harm than good to the people it was intended to help, allowing people to effectively drop out of society and to live off the labor of others without donors’ explicit consent. Rather than being a success story, the graphic above depicts a national tragedy. Anyone who truly cares about the well-being of the less fortunate and disadvantaged should work to dismantle this web of government dependency and replace it with a system of private charity, which is the most effective form of assistance in the United States and around the world. Image credit: U.S. House Ways and Means Committee staff, using Congressional Research Service reports and other data.